Today more than ever before many communities are feeling the effects of growth. Growth happens most in regions where there is a demand for jobs. For example in Silicon Valley in California many high-tech and social media companies flourish alongside community colleges and universities scattered throughout the region. Young students come from all over the country and world to study there and many are later offered jobs requiring their skills Others seeking job opportunities travel from all over the nation to take jobs there. But growth has consequences, especially rapid growth. Housing near jobs are in great demand and thus are expensive and unavailable. 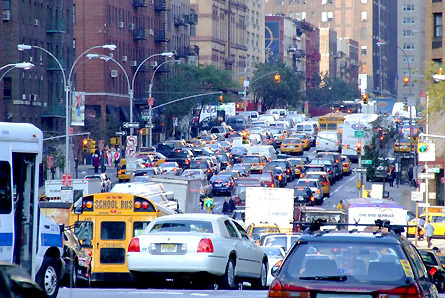 Since cars are almost the sole mode of transportation in the U.S. the roads and freeways become congested with people trying to commute to work from a distance. As more people move to jobs they must live further and further from work centers to where housing is more available and affordable. But this results in even more cars on roads and longer commutes. Such growth is unsustainable. When commuting time becomes a significant part of ones work routine it impacts the quality-of-life. So the car is the largest consequence of growth. Cars are simply too affordable, and the gasoline that powers them is far too cheap. Modern cars contain all the creature comforts of life making being stuck in traffic more bearable such as body fitting and heated reclining seats, surround sound audio systems, internet and cell phone connectivity with voice controlled email and social networks, air conditioners with individual climate controls, sound proof interiors, etc. 90% of cars on the road have only one occupant. Yet cars take up an enormous amount of space on roads for driving less than 10% of the time, and for parking more than 90% of the time. Parking lots for shopping and offices are often larger than the businesses themselves. Garages one-third the size of our homes exist just to park cars overnight. If all these things were to mysteriously disappear think of how much extra space there would be available for housing and businesses. Infrastructure dedicated to cars take up roughly one-quarter to one-third of a community’s real estate. That is a lot. And roads in many places become parking lots during the heaviest traffic. But you may ask how will we get around to go to work and shopping, etc. without cars? We must go elsewhere for examples. It takes a blend of efficient and economical transportation alternatives over decades for sustainable growth to evolve and eliminate the impact of cars. In many Northern European countries such as Denmark, Norway, and Sweden, their governments have been making city’s far more bikeable and less drivable over the last 30 years with great success. Half the citizens of Copenhagen, population 500,000, bike around town and to works. In the 1970’s their government decided to reduce the impact of cars by making streets safer and more convenient for bicycling. Today many streets are closed off to cars and only bicycles, pedestrian, and service vehicles have access. Some smaller cities have roads for cars and public transportation around the periphery of the city and bicycle and pedestrian traffic everywhere else. But it took 3 decades for this to happen. In the U.S. there must be a commitment by municipal governments to reduce the amount of car traffic that inhibits sustainable growth. This can start by making bicycle lanes far safer for all ages to ride by providing physical barriers between cars and bicycles. This will encourage more people to ride their bikes. There must also be better public transportation alternatives. But most of all there must be a source of income to make this all happen and disincentives to discourage people from driving their cars. One thing that most all nations have, with few exceptions including the U.S., are high gasoline taxes to discourage driving due to the economics reasons that creates a source of income for efficient and effective public transportation and bicycle infrastructures. But this requires a cultural shift for our car-centric culture. Do we have the will? Perhaps the problem is that we are in denial that cars are responsible for most of our growth problems. It threatens our unsustainable way of life, our comfort zone. This entry was posted in Environment, Transportation Alternative and tagged car, cars are affordable, cheap gasoline, Copenhagen, effects of growth, growth has consequences, high gasoline tax, making streets safer, public transportation, sustainable, transportation alternatives. Bookmark the permalink. I could not agree more. Beyond the many environmental benefits of removing cars from the core urban areas, there are also enormous social gains when people take the streets. Thanks, for a nice post.